Earn $0.33 in VIP credit (33 points)What's This? 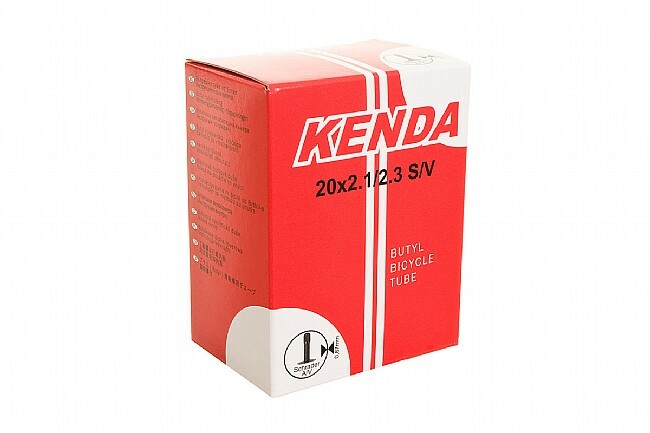 Kenda's Standard Weight Tubes are affordable and reliable. See pull down menu for sizes. Choose Presta or Schrader valves. Note: Tubes may vary in weight by 10 percent. Since I have had an impossible time getting a patch to stick to this Kenda tube, even though the price was low, it probably wasn't worth it because I can't patch a puncture. It's a throw-away product. It is a bike tube. Used to replace tubes on an old department store bike. Seems to hold air. What else is needed? I would have returned them except they are less than the return shipping price. I was able to shove them in the tire by doubling them over for a few inches but it was a lumpy ride and I found an actual 20 tube at a local bike shop. I am not actually sure what size they are but not the 20 advertised. This is a hard to find tube. Bike Tires Direct has them in stock cheap. An not beat the price. Fast Shipping and good product, thanks! Replacement for leaking older product. These are well made and very good value. I have a Schwinn Breeze (1977) that needed special tires. These tubes were recommended when I added the tires to my online cart. They were a perfect fit. My vintage bike is like new. Good tube for the money, but they can blow. I have 3 old Schwinn's, a Speedster, Breeze, & a Collegiate. All use the same tires & tubes for the Schwinn S-6 rims. The Kenda tires & tubes have been good. My only issue is that after a couple of years of service the glue or whatever seems to let go on the valve stem & you will feel a small blister or bubble on the lower valve stem, it will blow out. This has happened twice to me in the last year. Fortunately I was home when they blew, & not ten miles away from home. Survey says One out of every two tubes will be a leaker! Bought these tubes to replace one on a pull cart that had a bad tube. Decided to replace both tubes at the same time. Unfortunately one of the tubes had a hole in it and leaked air. Lucky for me one of the old tubes was still good and I was able to re-use. Customer service is non-existent for Bike tires direct, no reply to my Email regarding this issue. I did enjoy my other purchases on this particular sales order, but based on first impressions, I will probably not do business with this company for any future cycle needs. Your prices are great and I get fast shipping to my shop. I am a small bike repair shop. I buy and repair used bikes and sell them. I also repair customer bikes, Sometimes they are old classic bikes, sometimes they are top of the line new style bikes and I need parts and tires for all styles. Nice tubes, light and easy to install, hold up well and a good price. Seems like a solid tube. Maybe not the lightest tube you can find, but it works well with Schwalbe tires on our tandem. First tube worked great and no flats for an entire year. This year I ran over a goat head so I had to finally change a tire. Next two tubes had issues out of the box. First one had a weak wall and had a huge bulge in the tube. Second tube had a defective valve that I didn't notice till it went flat again. Hopefully this third tube will last a little longer until I get my next shipment of new tubes! Always a quality, well-priced tube. Always a quality, well-priced tube. Popped my last tube and this one got her in 2 days. Over 35 years I have installed hundreds of tubes on family and friends bikes. It seems the tubes of late are getting worse. I don't know what the composition of rubber is but I am ever finding patches won't stick to this crap. As cyclists we should demand at least a tube that holds air when installed. I use tuffy liners for most installs and don't feel the need for the higher priced tubes. But at the very least, I want them to hold air for the initial filling.